Preheat oven to 350. Meanwhile, in a large pot, boil zucchini and onion until tender. Drain thoroughly and arrange in a medium sized casserole dish. Mix together sour cream and milk and sprinkle with salt and pepper to taste. Pour over zucchini and onions. Sprinkle with cheese and bake uncovered about 20 minutes until bubbly and hot. 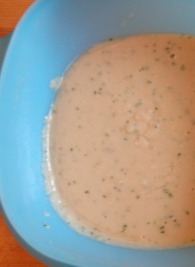 Serve hot by removing the zucchini and onions with a slotted spoon, it is quite saucy, in bowls. *low fat or even fat free is fine. 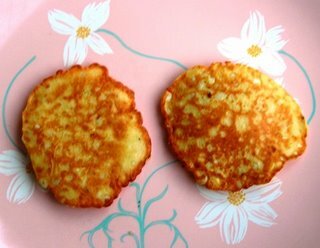 This was one of my most favorite foods when I was little and I still enjoy it made with fresh from the garden zucchini. We actually just called it "zucchini with sour cream" but zucchini au gratin makes the recipe seem more legitimate, don't you think? Preheat oven to 350. Butter and flour or spray with cooking spray with flour two loaf pans. In a large bowl, beat the eggs until light and fluffy. Add sugar, oil, zucchini, carrot and vanilla. Mix well. In a small bowl, whisk together dry ingredients. Add to zucchini/carrot mixture. Mix until well combined then fold in walnuts. Pour into prepared pans and bake for 1 hour. Cool on rack for 10 minutes then remove from pan. Delicious warm or at room temperature. *optional, I personally enjoy my bread walnut free. In baked goods, walnuts kind of remind me of baby teeth. 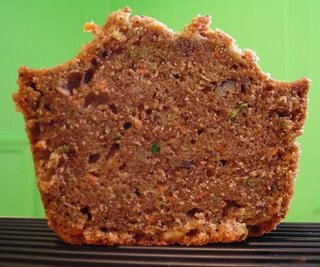 If zucchini bread is good, then carrot zucchini bread is even better. Just as moist but with pretty orange flecks and hint of sweetness. 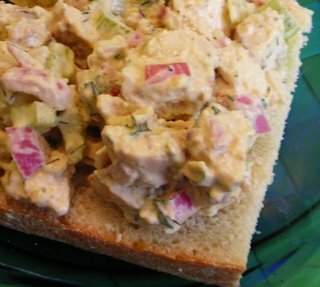 Very good spread with cream cheese. In a small saucepan, heat the milk and vanilla bean together until the milk just boils. Remove from heat and let cool for about 1 hour. Then remove the vanilla bean. Scrape out the seeds from the vanilla bean and add them to the milk. Discard the remaining bean pod. Meanwhile, preheat the oven to 350. In a medium bowl, whisk together the salt, flour and baking powder. In a large bowl, cream together butter and sugar until light and fluffy. Add egg and beat well. Alternately add the flour and milk mixture until well combined. Divide batter into about 20 lined or greased cupcake wells. 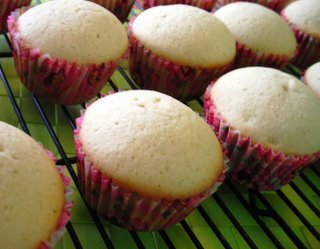 Bake 15-20 minutes or until a toothpick inserted in the middle of the middle cupcake comes out clean. Cool on a wire rack and then ice. Today is my (27th!) birthday and my sweet husband made me these vanilla bean cupcakes. They are so bursting with vanilla flavor it is hard to even put into words their incredible vanilla-ness. 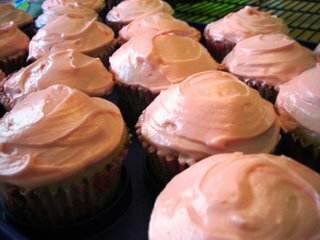 He frosted them with pink cream cheese icing. Preheat oven to 375. In a large bowl, whisk together dry ingredients then thoroughly mix in all of the remaining ingredients. 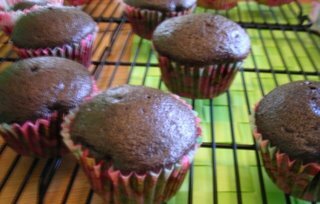 Fill 12 greased or papered cupcake wells 3/4 of the way through and bake 15 minutes or until A toothpick inserted in the center cupcake comes out clean. We sprinkled ours with confectioners' sugar. Today is my birthday and we invited a couple of friends over cupcakes after dinner. One of them is vegan so my husband made these vegan cupcakes. We had never made a vegan baked good before and were pleasantly surprised. They are very moist and chocolate-y. We didn't miss the eggs or butter at all. This cupcakes completely debunk the myth that vegan baked goods taste bad. 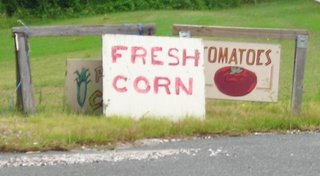 I don't think most people would be able to tell the difference between these and traditional baked goods. We sprinkled ours with confectioners' sugar but you could also frost these with a traditional buttercream icing subbing margarine in for the butter. In large sauce pan, heat the oil and then saute onion, garlic, crushed hot red pepper, and carrot for about 10-15 minutes or until soft and fragrant. Add eggplant and saute another 15-20 minutes until tender and darkly colored. Add salt and pepper to taste and stir. Add tomatoes and cook for about 30-40 minutes. Serve over hot pasta. 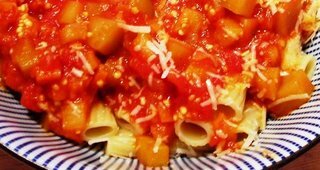 This was the best eggplant/tomato sauce I ever tasted! The eggplant was really tender and absorbed the yummy garlic and onion flavors. We served this with some chicken and a sprinkle of Parmesan, but it would be good all on its own. Preheat oven to 375. Grease and flour or spray with baking spray with flour one 8 inch square pan. In a large bowl, whisk together the baking powder, sugar, flour and cornmeal. In a small bowl or measuring cup, whisk together the egg, butter and buttermilk. Pour over the dry ingredients and mix until well combined. The batter will be some what fluffy. Pour into the prepared pan and scatter the blackberries along the top. Bake 25-30 minutes or until the top begins to brown. Cool slightly on a wire rack then slice and serve warm. We had a bit of blackberries left after making the clafouti yesterday so I came up with this recipe to use the rest of them up. 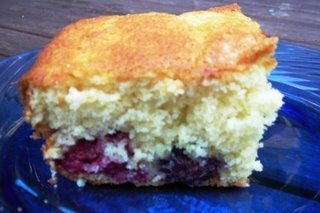 I still had cornmeal on the brain from making those corn fritters last week so I thought I'd see how a cornmeal cake would taste with blackberries. It came out very well, it's a more rustic dish than the clafouti but just as delicious. The texture is a bit coarser than a typical cake but it's not as dense as cornbread. It is actually surprisingly fluffy. The berries do sink to the bottom, if this bothers you, toss the blackberries in a little bit of flour before scattering them over the dough. I personally don't mind, but it would look pretty with the berries sort of suspended in cake. Preheat oven to 375. Butter or spray with baking spray with flour one 9 inch round pie or tart pan*. Sprinkle the blackberries with the one tablespoon of sugar and arrange on the pan. Split the vanilla bean and scrape the seeds into a saucepan. Add the vanilla pod, milk and cream and heat until you see small bubbles. Remove the bean pod from the pot and then remove the pot from heat. In a medium bowl, beat together sugar and eggs until light and fluffy. Slowly add the flour and salt and mix thoroughly. Slowly beat in the milk mixture. Finally, stir in the Cointreau. Pour the custard over the berries in the pie pan. Bake for 30 to 35 minutes or until puffy, browned and the center no longer jiggles to the touch. Excellent warm or at room temperature. This is best the day it is made. 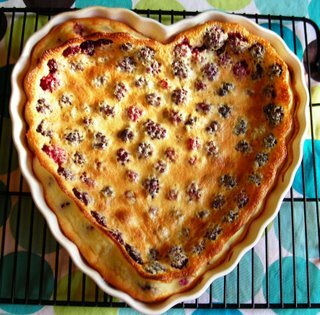 *A heart shaped pan was used here, but traditionally a clafouti is made in a round tin. Clafouti (sometimes called clafoutis) is a French dessert that is typically made with unpitted black cherries. 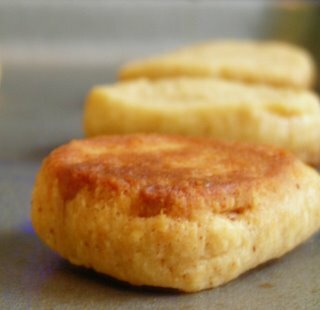 The best way to describe the texture is that it is sort of like baked custard crossed with a fluffy pancake. We used blackberries because they are in season and are our favorite berry. Other berries and fruits would be good as well. My husband had the idea for this dessert almost a year ago and has been waiting until blackberry season to make it. It was well worth the wait, the caramelized bottom and top are delightful and the berries add a welcome bit of tartness. Evenly divide the garlic, dill and cucumbers among four wide mouthed pint jars. In a large bowl, mix together vinegar, water, red pepper flakes, celery seed, salt, mustard seed and dill seed. Use a funnel to fill each jar with brining liquid. **The spices may float to the bottom, so use a spoon to evenly divide anything that is leftover into the jars. Cap tightly and refrigerate at least one week before eating. *Before adding the mustard seed, red pepper and dill seed, I crushed them slightly in my hand. **I suggest you do this over a large bowl. 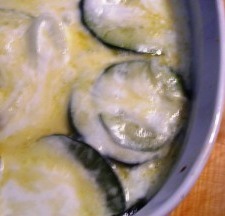 The cucumbers start to float and displace liquid. Add the overflow back into the brining mixture before you fill up the next jar. 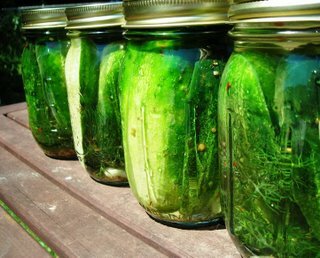 I have always wanted to make dill pickles at home but traditional canning always seemed a little scary. Refrigerator pickles seemed to be the logical solution. These pickles came together super fast and look so pretty in their jars. Judging by how delicious they smelled going into the jar and how pickle-y my hands smell now, they should be fantastic. 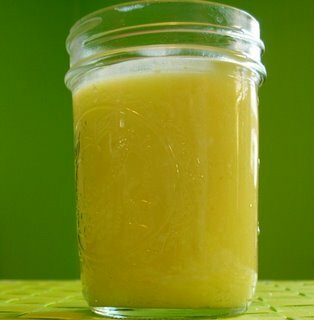 Pour the beans, garlic, bean liquid, olive oil, salt, pepper and lemon juice into a food processor or blender. Pulse until almost smooth. Add the parsley and pulse again until it forms a thick paste. Refrigerate or serve immediately. *these are sometimes labeled as "white kidney beans". 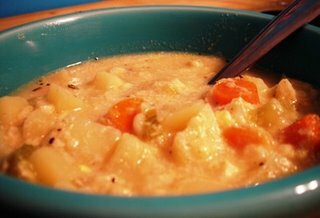 You could also use navy beans or great northern beans. This heat wave (it was 103F in the shade this afternoon!) is really cutting into my cooking/baking time. I had to make this dip so I had something more interesting to eat than leftover grilled steak or tuna salad for lunch. It's so tasty I almost don't miss cooking.